The Fridge now has the FreeTime options "Serve Platter..." and "Prepare for Contest". The updated fridge is included in the archive "CounterCultureSet_Appliances.rar", attached to this post. The updated fridge is included in the archive "CounterCultureSet_Appliances.rar", attached to this post. 09 FEB 2008 - ADDED: "Tower cabinets"
The updated versions are included in the archive "CounterCultureSet_HangingModules.rar", attached to this post. There was an annoying tooltip, now removed, that showed up when clicking on the fridge. The updated versions are included in the archive "CounterCultureSet_Appliances.rar", attached to this post. 20 OCT 2006 - HUGE UPDATE! The "CounterCulture" furniture is kinda boring... right? WRONG! Your kitchen will never be the same, with this marvellous set of counters, islands, appliances and floors! 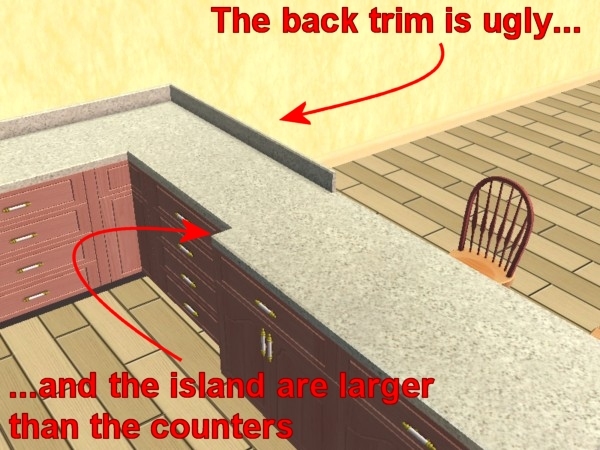 [Pic1] [Pic2] [Pic3] You can now connect flawlessly counters, island and bar counters, without ugly "back trims" on the counters, and perfectly pairing the surfaces of the islands and the counters! 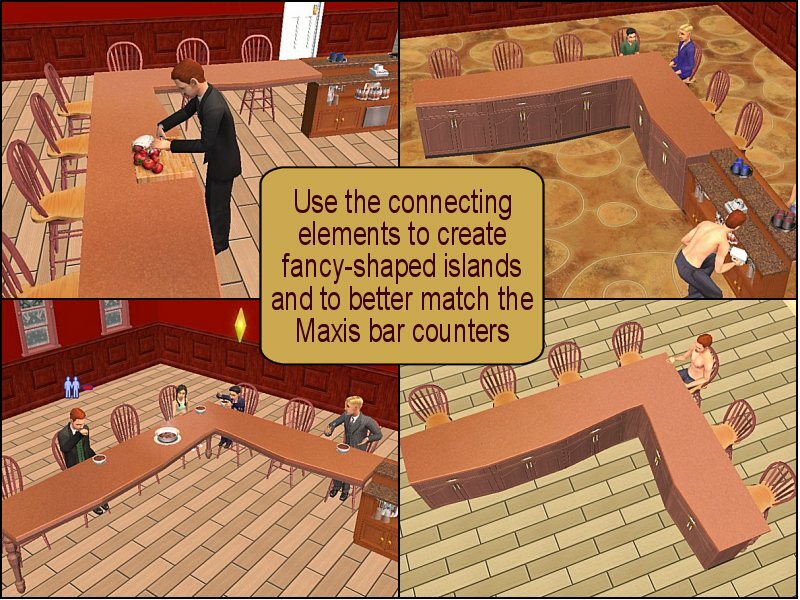 [Pic4] You can create fancy-shaped islands, mixing and matching the modules (Slim Counter and Islands, Island Top, and even the original Maxis counters) at your heart's content! [Pic5] The appliances are coordinated with the counters, and they are really encased in the counter: no metal panels will be visible! 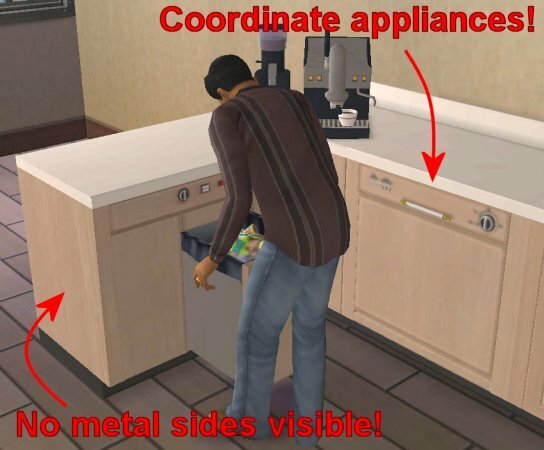 [Pic6] You can finally put small appliances on the corner counter, and make your sims use them! [Pic7] Coordinated flooring is provided along with the set, in both Wood and Marble! The entire "CounterCulture" Modular set is compatible with any game, from the base game to Seasons. The "Collection" files are NOT to be put in the Downloads! They go in (Documents)\EA Games\Collections. The Collections do not contain any object: they are just a list of all the CounterCulture items. Once installed, you can open the collections from the Buy Mode catalog (click on the icon that looks like a folder) and you will find all the existing collections. Among them, there is the "CounterCulture Set", that groups together all the CCulture items, including the coordinated floors and the Maxis counters. 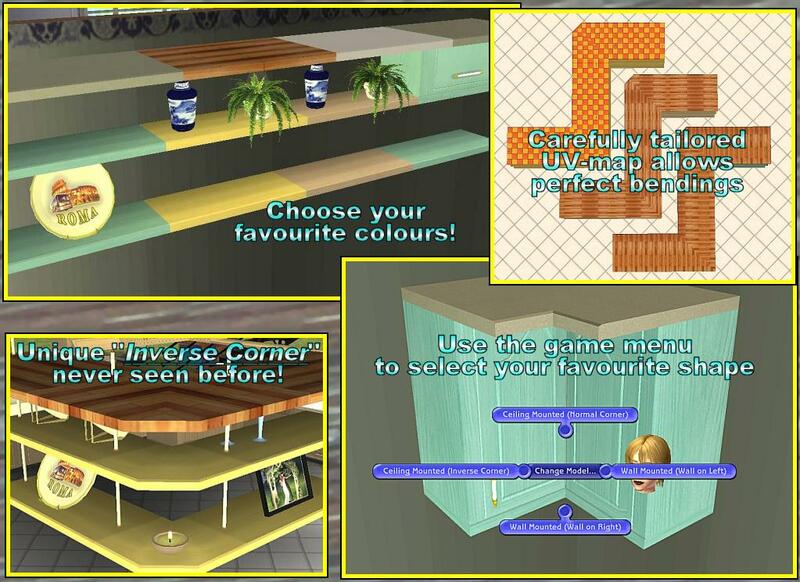 All the counters and the islands borrow the textures from the original Maxis "CounterCulture" counter: therefore, if you want to recolour our set, just create a recolour for the Maxis counter. On the other hand, every recolour for the Maxis counter that you may already have in your Downloads will be automatically available for the whole "CounterCulture" set. Only exceptions are the Appliances (Trash compactor and Dishwasher): they have their own texture, that must be recoloured separately. Maxis for the original CounterCulture counters. You can include this set in lots uploaded to completely free sites (NO EXCHANGE! ), as long as you grant credits to MaryLou and Numenor and you provide a link to this thread (not just to MTS2!). 06 NOV 2006 - UPDATED: "StripedWood" Recolours. Both the Horizontal and the Vertical "StripedWood" recolours have an improved texture that give a more natural look to your CounterCulture counters and Islands. Also, the "dirty" texture has been fixed in both recolours. UPDATED - Counters and Islands, all of them: PLEASE REDOWNLOAD. All the UV-maps (and therefore, the exterior look) have been improved; also a bug that prevented the sims to prepare meals on some islands has been corrected. 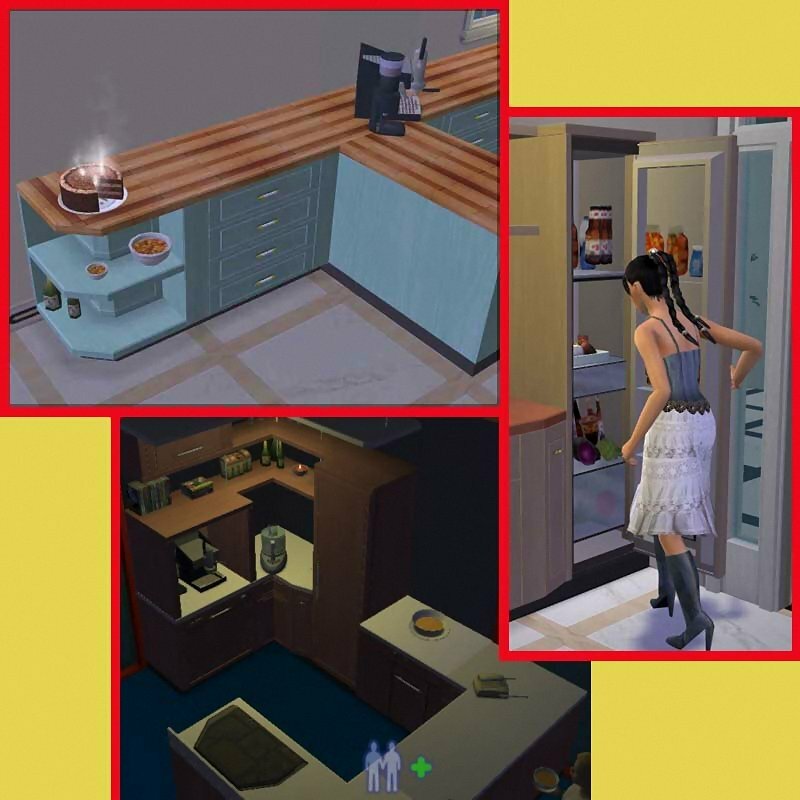 Look at the examples in the screenshots, in order to have an idea about how to use the various kitchen modules. The most versatile pieces of furniture are doubtless the Connecting Elements: they allow you to join counters and islands having different sizes; and they can also be used alone, so to give a "wavy" shape to a line of counters. Please note that all our islands are capable of forming corners, but this feature is available only to NL or OFB users: the base game and UNI don't include this feature. All our islands and counters (even the ethereal "Island Top"!) 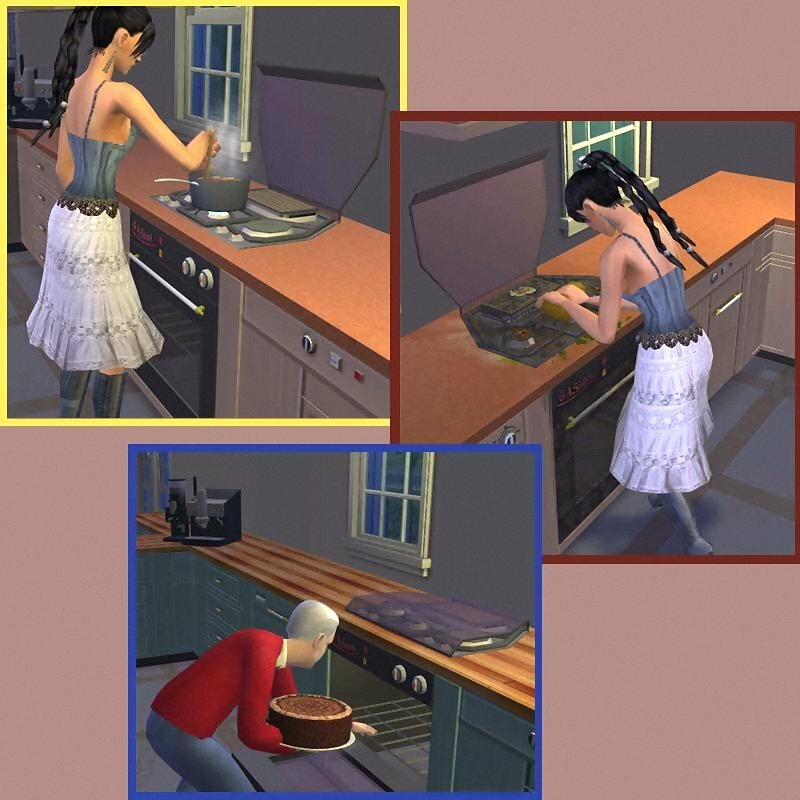 allow the sims to prepare meals on them, and get dirty (like all the other counters ). 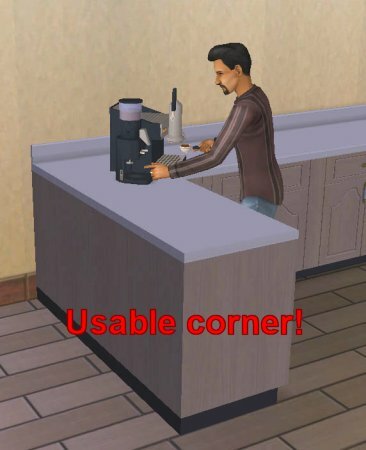 All the island corner are usable by the sims: you can put an espresso machine, a mixer, a telephone or whatever on the corner counter (or corner island), and the sims can correctly interact with the objects. 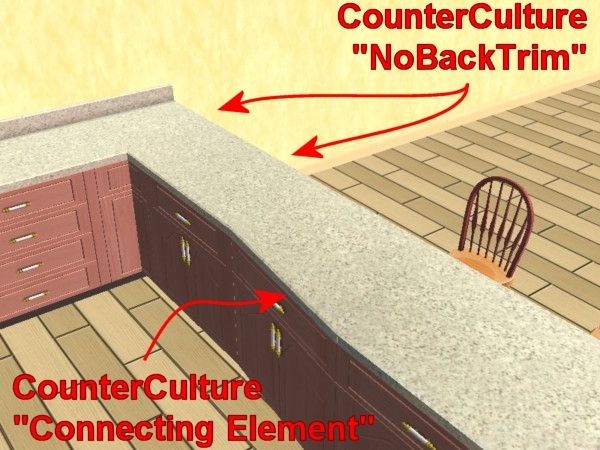 As explained in Post #1, all our counters and the islands borrow the textures from the original Maxis "CounterCulture" counter: therefore, if you want to recolour our set, just create a recolour for the Maxis counter. On the other hand, every recolour for the Maxis counter that you may already have in your Downloads will be automatically available for the whole "CounterCulture" set. The Recolours we provide will therefore apply to the whole set, as well as the Maxis CounterCulture items. Our recolours will apply also to the appliances, including the Trash compactor and Dishwasher. In the archive "CounterCultureSet_Recolors.rar" you will find the recolour "Sun" (for the top and the finish), and the two recolours "StripedWood Vertical/Horizontal" (top only). That lovely shade of sycamore wood you used for your counters don't match with Maxis floors? No problem! We provide many coordinated floors to solve any matching problem! There are wooden floors in the same tints as the counter finishes, and also marble floors to match the counter tops. The archive "CounterCultureSet_Floors.rar" contains all the 10 (ten!) coordinated floors, including the new Wood-Sycamorepearl. Our counters and Islands are way better then the original Maxis ones, and therefore, if you want to mix them with Maxis counters, the result would be ugly to see. 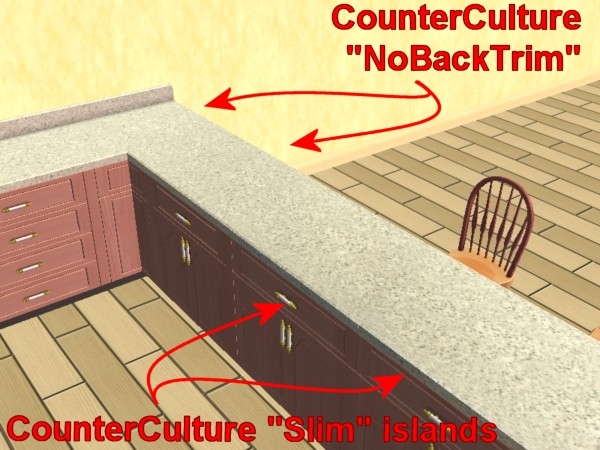 The provided "Global Mod" is a FIX for the Maxis counters and island, that will make them look much better, and will allow seamless connections with the entire CCulture Set. The updated version of the Global Mod will also hide the metal sides of the large appliances even if you mount them under Maxis counters. If you need to contact us, PM directly to "Numenor" or "MaryLou". #3 24th Mar 2006 at 10:51 PM Last edited by MaryLou & Numenor : 9th Feb 2008 at 11:23 PM. 09 FEB 2008 - ADDED: 2 "Tower Cabinets"
These are two different Multi-Cabinets (so-called "Towers"), featuring an automatic mesh change: whenever a wall is detected behind, the lower part appears. Their best usage is placing them right over a counter: this way, the tower will look as if it was mounted on the counter top (while it's actually hanging from the wall, like all the other cabinets). Of course, you can freely choose the mesh you want, via the pie menu in live mode. ALL these modules have built-in light, and feature a special Multi-Model Mesh: each module will automatically change its shape to adapt to the surrounding walls; therefore, each hanging module actually contains several different shapes that you can choose from, at your heart's content! Look at the animated GIFs to see all the alternative meshes! If you are not satisfied with the mesh automatically chosen by the game, you can always go to live mode and manually change the shape using the object menu. Another unique feature of this update is the special, never-seen-before "Inverse Corner", that provides the maximum flexibility to your hanging composition: using the normal and the inverse corners, infact, you can turn by 90° on the loft or on the right (which is a feature that no other modular kitchen set has ever offered! :D). 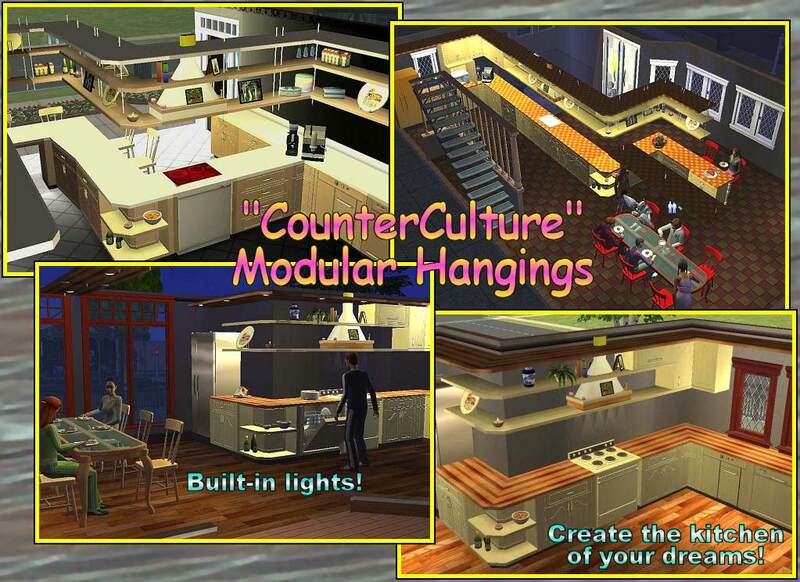 All the hanging modules, just like the previous ground ones, work in any game configuration, including the base game only; and they borrow the textures from the original Maxis "CounterCulture" kitchen counters (so that any recolour for the Maxis counters will automatically apply to the hanging modules, too). The Cooker Hood can be found in the catalogue: Buy Mode -> Appliances -> Misc. FAQ: I'm building a new lot, and no sims live in it; since I can't go to Live Mode, how can I manually change the shape of the module? You can't, sorry. You have to rely on the automatic routin, that will choose the mesh most suitable for the walls surrounding the module itself. When you move you sims into the new lot, you can then change the shape of the modules at will. FAQ: In my lot there are sims living, and I noticed that the auto-configuration of the modules doesn't work any more! Are they broken? No, the auto-configuration routine is not broken; but - in order to prevent unwanted changes - as soon as you go to Live Mode, the auto-mesh feature deactivates itself, for all the modules in the lot. New models picked from the catalog will still have their auto-configuration active (until you go again to Live Mode). The Fridge now has the FreeTime options "Serve Platter..." and "Prepare for Contest". The updated fridge is included in the archive "CounterCultureSet_Appliances.rar", attached to the first post. The updated fridge is included in the archive "CounterCultureSet_Appliances.rar", attached to the first post. There was a bug, now solved, that prevented the option "Stock" to appear on the Fridge in Seasons. Now the sims can correctly put their vegetables in the fridge. The updated version is included in the archive "CounterCultureSet_Appliances.rar", attached to the first post. Now the Fridge has the "Get Leftovers" option, and the Trash compactor has the "Add to Compost" option. We know how bad looks a stainless steel appliance mounted under a CounterCulture counter... And therefore, here are two special appliances that perfectly match the CCulture set, for both the external shape (handles, finishing) and for colours. If mounted under our special "No-Trim" counters, no metal parts will be visible from the outside (this feature is not available when the appliances are mounted on Maxis counters). Attention: the Trash compactor and the Dishwasher have their own texture, that must be recoloured separately from the rest of the set. On the other hand, the Fridge and the Stove borrow the textures from the Maxis CounterCulture counters, like the other pieces of the set. In order to better match the other pieces of furniture, both the Fridge and the Stove can have the back trim or not. As soon as you pick them from the catalog, the back trim is automatic: it will be showed whenever a wall is detected behind the appliance; and it will be automatically removed as soon as you move the appliance away from the wall. But in any case, a "manual" trigger is available: go to live mode and click on the Fridge or Stove, and choose "Back Trim.../Show" or "Back Trim.../Remove". This is what I was waiting for from the start of Sims2! Thank you very much for doing this fantastic job!!! Brilliant work by both of you! I am especially greatful for the fact that the appliances will coordinated with the counters and will not have their metal panels poking out at the sides. Thanks to both of you. Amazing work y'all ... Just wanted to let you know that you can't download the files with Firefox due to the ampersand (&) in the filenames I had to go in and use the evil blue e (Internet Explorer) to be able to get these! Needless to say, I got them and got out LOL ... so if there's a download problem by others, this is why! Thank you both sooooo much! This set is incredible and I love that the polys are lower than the Maxis ones. It'll probably be a little easier on my computer! I'm really impressed with all of your hard work on this and I can't wait to see what you two make next! 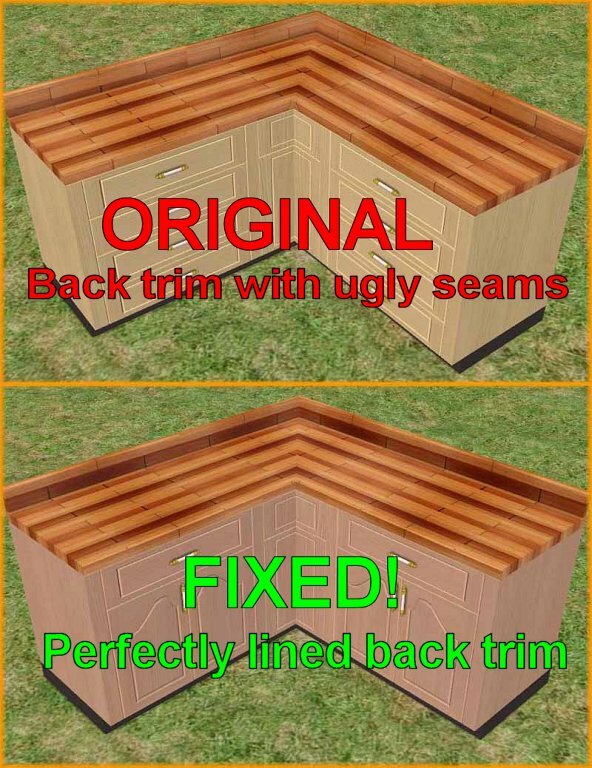 Are there plans to make a set like this for the cheap counter? Thanks again. "In some cultures what I do is considered normal"
Seize the moment... coz tomorrow you might be dead! Wow!! This is great work!! I love how everything look so coordinated...even the floors! Thank you, Loverat. I was about to have a serious confuzzlement but you saved me. All hail the great creators! This is a brilliant idea to solve something I considered to be a problem. I have been wanting a seamless connection with the island counters and regular counters for a long time now. THANK YOU! This should be featured...WOW!!! Thanks!!! Click HERE and you'll get a surprise! #19 25th Mar 2006 at 12:19 AM Last edited by platinum : 25th Mar 2006 at 12:25 AM. This is just outstanding But then ALL your work is. I don't mind if you call me "MSD" or something for short. #21 25th Mar 2006 at 12:25 AM Last edited by Numenor : 19th Jun 2006 at 2:13 PM. Luckily Delphy has already fixed the issue! Great Delphy! I was looking for something just like this. Thanks. Thank you both so much! You don't know how much time I've spent with moveobjects on and snapobjectstogrid false just trying to get the counters and islands to look good. This will be a big help and huge time saver! Please feel free to use/clone/copy/share anything I have made in whatever manner you wish. Have fun! These recolours may or may not be endorsed by MaryLou & Numenor.